Considering it’s the last week in April 2016, I should probably be talking about the new Huntsman: Winter’s War movie. But I can’t seem to muster up any interest in seeing that film (note to Hollywood: when the Fairy Tale Geek doesn’t want to watch your fairy tale movie, it’s a bad sign). So, I’ve decided to talk about a series I discovered on the internet instead. Lately I’ve been looking into works that take inspirations in style and imagery from fairy tales but don’t really adapt the stories. There are a few of them, but one of my favorites so far is RWBY. 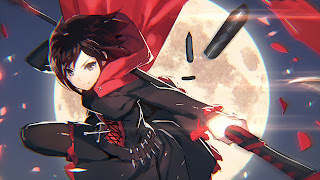 RWBY (pronounced “Ruby”) is an anime-inspired animated web series created by animator Monty Oum and produced by Rooster Teeth Productions, a production company known for producing Machinima (animated productions using video game images and backgrounds). RWBY is one of their completely original, in-house developed series (ie: not Machinima). RWBY takes place in the world of Remnant. Remnant is a future world in which a huge war wiped out a large chunk of the preexisting human culture. Now this world is not just inhabited by humans but also humanoids bearing animal traits called the Faunus and the mysterious monsters called the Creatures of Grimm (there’s that name again, and used for a type of monster. Joseph Jacobs never has to put up with this kind of crap). To fend off the Grimm and other things that threaten the peace, some young people go to special academies where they learn how to become Huntsmen and Huntresses. 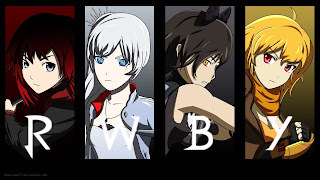 RWBY focuses on four young Huntresses in training who attend Beacon Academy in the city of Vale. They are Ruby Rose (based on “Little Red Riding Hood”), Weiss Schnee (based on “Snow White”), Blake Belladonna (based on the female lead from “Beauty and the Beast”) and Yang Xiao Long (based on “Goldilocks”). Their initials also coincide with the most notable color in their designs: Red, White, Black and Yellow. All the characters have unique personalities, backgrounds, abilities and weapons to match. The hot-headed Yang gets stronger the longer she fights and has gauntlets that also double as guns. The wealthy and somewhat arrogant Weiss has a fencing foil that also has a rotating supply of an element called Dust which allows her to channel different magical effects. The elusive Blake carries a ninja sword and can create a shadow double of herself. Finally, leader Ruby Rose has blinding speed and carries a giant scythe that can transform into a sniper rifle. That’s right, it’s a show about a version of Red Riding Hood who carries a sniper rifle. And no, it’s not written by someone at the NRA. It’s so much better than that. The references to old stories do not exactly end there. 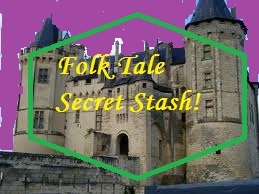 The show is filled with nods to fairy tales, history, legends, myths and literature. One of the show’s villains is named Roman Torchwick, based on the character of Lampwick from Collodi’s Adventures of Pinocchio. Another is named Cinder. You can probably guess what her inspiration is. My personal favorite is an android girl named Penny Polendina based on Pinocchio. There are even echoes of the stories in the main characters’ lives. Weiss has family issues. Blake has a rather “beastly” controlling ex-boyfriend. However, all of this is mostly window dressing. It all takes a back seat to the new story of this world that’s been created. The old culture has been wiped out including the old stories and as a discussion of fairy tales in volume three shows, new tales have taken their place. The old archetypes still exist but they’re more echoes that manifest themselves in the new characters. But if you’re worried that’s going to turn you off from the series then don’t. The plots to the series are great. The suspense in this show builds perfectly. The characters are all interesting and lovable (or at least love-to-hatable). The voice acting is terrific. The action scenes are all dynamic and interesting. There are even some elements that are just part of the background that are just fantastic. For example, they show some love to the blended families out there with the fact that Ruby and Yang are half-sisters. They acknowledge that they have different mothers and there is some drama associated with it, but none that creates animosity between the two girls. All this, plus the music rocks. Just tell me that this song and this song aren’t awesome! I’m finding it hard to come up with anything to criticize in this series. If I had to pick one, it would be that the tale-inspired character designs aren’t necessarily as evocative as maybe they were intending them to be. The primary one I’m thinking of is Blake, who is supposed to be based on the Beauty from “Beauty and the Beast”. However, since she’s a Faunus with cat ears, she reminds me more of “Puss in Boots”. Weiss might also throw some people seeing as both her hair and skin are “as white as snow” rather than just her skin in the case of the traditional Snow White. This is a problem that stems more from the fact that classic fairy tales often don’t delve too much into description. For every Little Red Riding Hood or Goldilocks that has some kind of visually defining aspect, there’s a Jack or Beauty/Belle who’s left up to the imagination. That’s a minor quibble at this point, though. RWBY is a highly entertaining and addictive show. It also happens to be a show that just ended on a huge cliffhanger. I am glad to say that the show will pick up with volume four in Fall 2016. This is especially true given that the show’s creator Monty Oum is no longer with us. He passed away on February 1st 2015 from an allergic reaction he suffered while undergoing a medical procedure. Luckily, his creation lives on as his legacy. You can find the first three volumes of the show on the Rooster Teeth website as well as on the official Rooster Teeth YouTube channel. If that’s not enough for you, there are a number of Rooster Teeth products on offer including soundtracks with those kickin’ theme songs and a game on Steam. Good luck and if you’re anything like me you’ll be eagerly awaiting the debut of volume four this Fall. 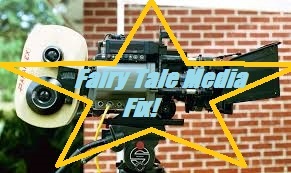 So, I’ve touched on a number of things that fall under the banner of “fairy tale” in the grand soup that is American pop culture (even though some of them technically aren’t fairy tales). I’ve talked about folk tales, children’s literature and legends. However, there is another thing that gets the fairy tale label. It’s something that is so simple that you could almost forget about it or write it off, but it’s almost always there. It is the nursery rhyme. 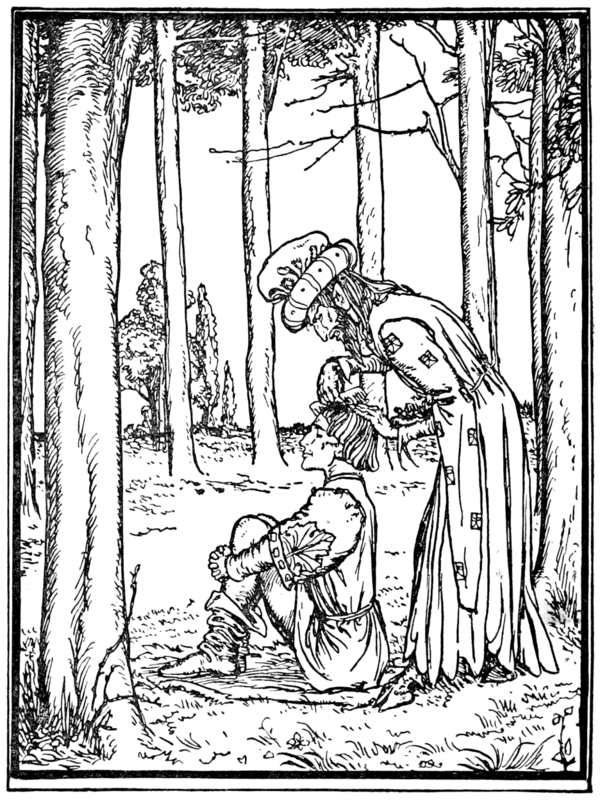 Nearly every mash-up of fairy tale material includes at least one. But why? Why is Little Boy Blue such a big player in Fables? Why is there a character named Humphrey Dumpty on the Ever After High web toons? Why does Little Bo Peep show up in both Once Upon a Time and The 10th Kingdom? What are these rhymes? Where did they come from? And why do they stick with us? 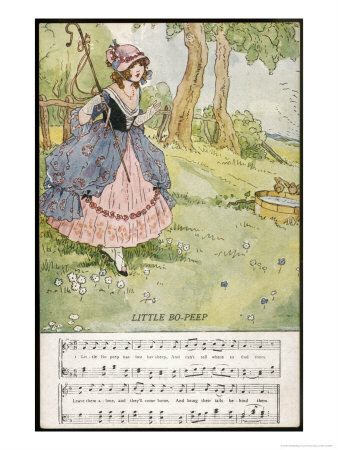 Near as I can tell from some rudimentary research, while they are a form of folklore, most nursery rhymes have only existed since about the 18th century at the earliest. 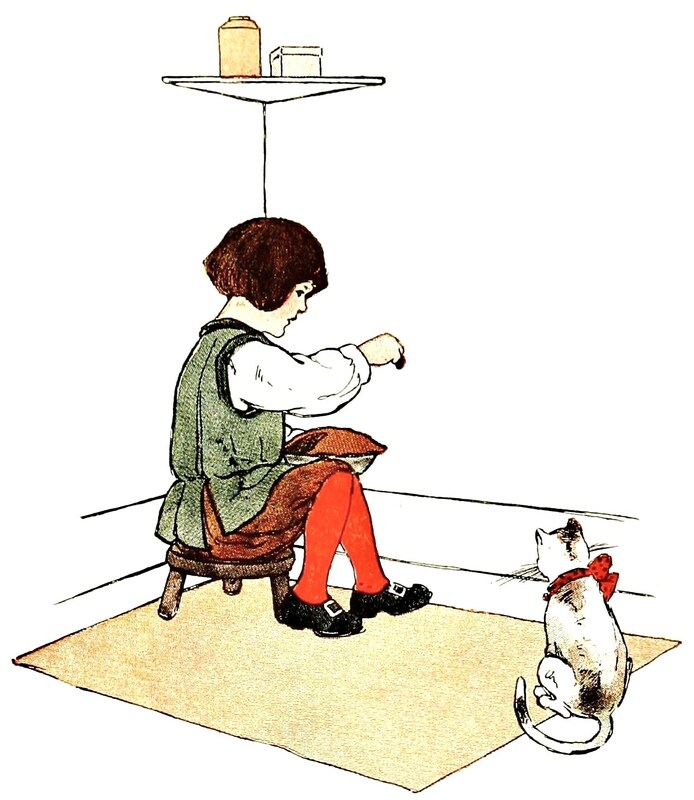 Also, while many rhymes are easy to remember and pass along by word of mouth, books of nursery rhymes have existed since the publication of Tommy Thumb’s Song Book in 1744. There seem to be a few different types of nursery rhymes. There are lullabies, riddles, learning rhymes and then just rhymes that don’t fit into any of the previous categories. Interestingly, it seems that those last ones are the ones that most intrigue scholars just because of how people want to know where they came from and what they were used for. 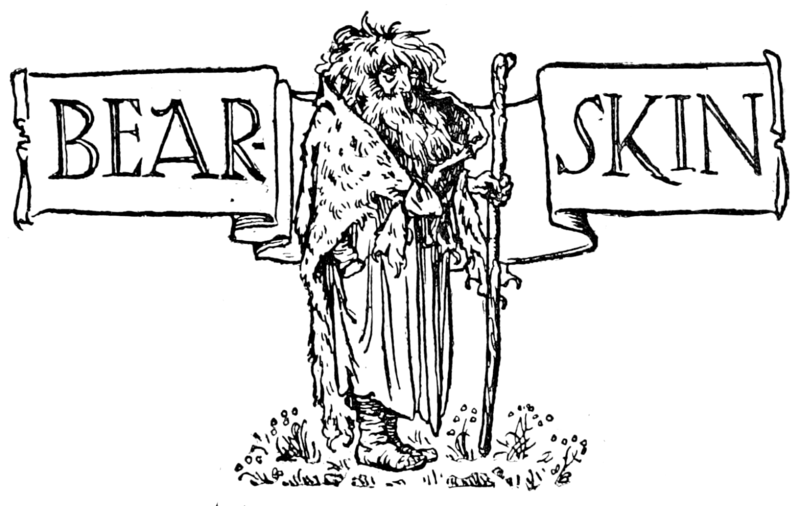 Though it’s possible these rhymes were just developed for entertainment purposes, scholars have theorized for years that certain popular nursery rhymes were actually veiled references to historical events and people. A lot of this can be traced back to a book from 1930 by Katherine Elwes titled The Real Personages of Mother Goose. The argument is that the rhymes existed as ways to ridicule, criticize or protest the British crown or other public officials in secret so as not to get accused of treason. The thing is that a lot of this seems speculative at best. Every source I look at doesn’t provide any proof or point to any supporting sources. Also, theories seem to contradict each other. One theory claims that “Mary, Mary Quite Contrary” is about Queen Mary I of England and her tendency to torture and execute her enemies. Meanwhile, another source claims it was about Mary, Queen of Scots and her more frivolous tendencies. One source claims that “Humpty Dumpty” started out as a riddle with the answer being “an egg” while another claims that the original “Humpty Dumpty” was a cannon that fell from the wall of an English fort during the English Civil War and couldn’t be retrieved. I’m kind of afraid to ask what “Hey Diddle Diddle” might be about. Interestingly, the Walt Disney company once made a cartoon based around these theories. This gets at the question of where they come from, but it doesn’t answer the other questions. However, I suppose we can attempt to answer them with a little bit of common sense. The reason that these rhymes probably stick with us is because they’re such a big part of our childhoods. Lots of developmental psychologists and doctors (as well as the occasional parenting blogger) have talked about how nursery rhymes help small children develop language and spatial skills. Also, the rhyme schemes and rhythm of the rhymes makes them easy to remember. As for why every fairy tale mash-up uses them, a large part of it stems from the fact that “fairy tale” is usually translated to “Really old public domain stuff we remember from childhood” as I referenced at the beginning of this post. However, there is something else that has come to mind that makes nursery rhyme characters really handy to use for these kinds of projects. Nursery rhyme characters have names. No, really. 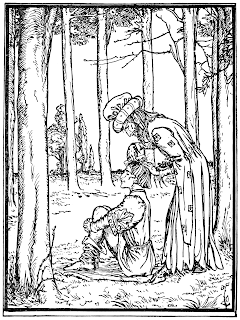 Fairy tales from the folk tradition usually have characters that don’t have names. They’re defined by things like profession, age and gender. When they do have names they’re usually just very common names (like Jack or Hans) or they’re names that are boiled down descriptions (like Snow White or Bluebeard). This is because fairy tales are almost pure plot with basic character types to carry out the roles. Nursery rhymes, on the other hand, hinge on rhythm and rhyme scheme. So, they usually have names that fit those rhyme schemes. Often times they’re descriptive as well, but they are also memorable. They’re names like Humpty Dumpty, Little Bo Peep, Jack Horner, Jack Spratt and Solomon Grundy (the latter is not to be confused with the DC Comics super-villain that was named after him). Using them is probably a lot easier than using a character that’s just identified as “the youth” or “the woodcutter” for an entire story. On top of this, many of these characters also have notable images that have stuck with us from picture books of years past. These are images that are generally not trademarked by anyone anymore. 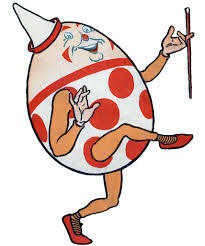 Humpty Dumpty tends to look like a gigantic egg. 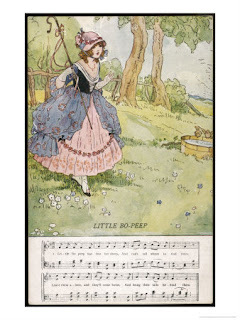 Little Bo Peep is dressed like a traditional shepherdess. Little Boy Blue is dressed all in blue and carrying a horn. You get the picture. Basically, most “fractured fairy tales” or “fairy tale mash-ups” hinge on the audience’s previous familiarity with the characters and source material. 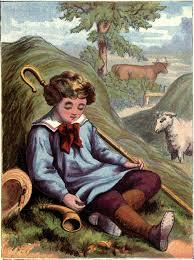 In some ways, nursery rhymes have that familiarity in ways that fairy tales often don’t. I’m just skimming the surface here. For a collection of these rhymes, a good place to start would be right HERE. I know there’s more that probably could be said about a form of folklore that has such staying power. Maybe I’ll revisit this topic again in the future. We’ll see. 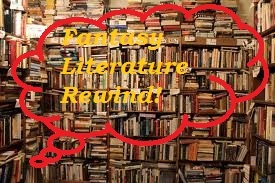 Hey, it’s the return of Fantasy Literature Rewind! This is the column that looks at classic children’s fantasy literature that may not be fairy tales but might as well be by association. 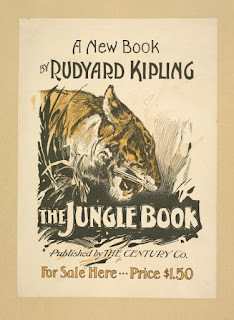 Today we’re going a little farther from the fairy tale well than usual and celebrating the release of Disney’s newest adaptation by shining the spotlight on Rudyard Kipling’s The Jungle Book as well as a little bit of The Second Jungle Book (I’m actually still reading that one, but the review must go on). Before I go on, I’d like to say that this book actually holds a pretty important place in my heart. 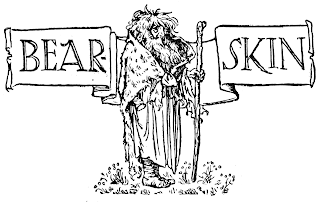 I may have mentioned once or twice that I discovered folklore through a unit about tall tales and legends that my troop did while I was a Cub Scout. Now, the Cub Scouts are called Cub Scouts because they draw a whole lot of their imagery from The Jungle Book. I believe the founder of the Boy Scouts may have actually been a friend of Kipling’s. I read the first book when I was a child, but didn’t know the second one existed until rather recently. Now first we should look into the history of the author. 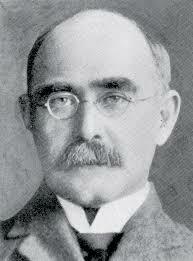 Rudyard Kipling was born in Bombay in 1865. He spent his earliest years in India until at the young age of five he was sent to his home country of England to be educated. These are generally accepted to be some of the most miserable years of his life. At age twelve he started going to United Services College at Westward Ho! (“college” being an old-fashioned term for a boarding school) and began developing his writing ability. At age sixteen he returned to India, where he started work as a journalist and wrote stories and poems in his spare time. Kipling’s life knew all sorts of travels as well as tragedies including the loss of a wife and a son. He wrote a number of stories and poems including his works for children, which includes both Jungle Books, Just So Stories, Kim and Captains Courageous. 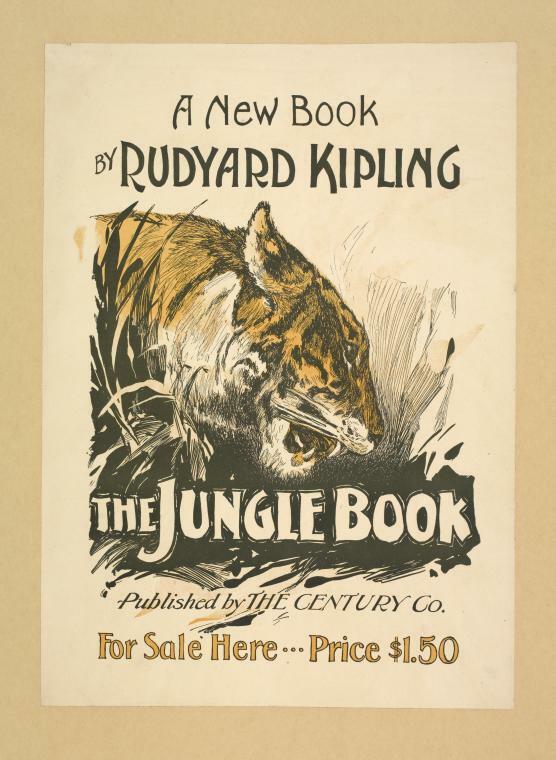 Though many people may not know it, both Jungle Books are anthologies. They contain numerous different stories, most of them featuring nature or animals in some ways. The centerpieces of both books are the Mowgli stories (note: according to Kipling’s daughter, Mowgli is pronounced “Mow-Glee” with a distinct “ow” sound, not “Moe-glee”). The Mowgli stories center on a young boy who is raised in the Indian jungle by wolves. He is also mentored in the ways of the jungle by Baloo the bear, Bagheera the panther and Kaa the rock python. His antagonists include the tiger Shere Khan and the Bandar-log, a tribe of lawless monkeys. 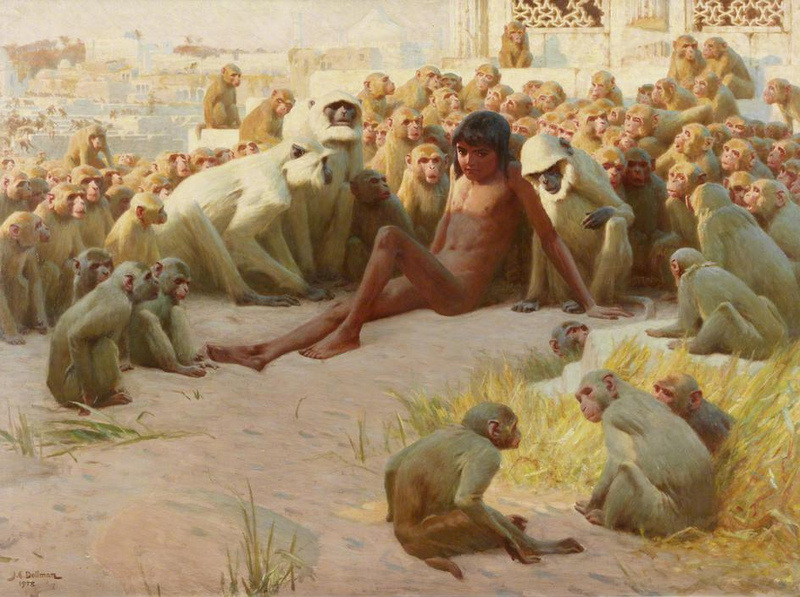 People may not realize it, but the Mowgli tales are very influential. There have been any number of stories of wild-men or people raised by animals. For example, just like Mowgli, Romulus and Remus were raised by wolves for at least a little while. The epic of Gilgamesh had its own wild-man named Enkidu. And let’s not forget the Grimms’ own wild-man “Iron Hans”. However, Kipling kind of brought the idea back. Without Mowgli there likely wouldn’t have been a Tarzan or Rima or Sheena or Ka-Zar or any of the other wild-person jungle heroes in adventure fiction of the late 19th and early 20th century. It was the Mowgli stories that also introduced the notion that there is a “Law of the Jungle”. The impact of these stories may also be seen through the number of times they have been adapted. One notable adaptation came out in 1942 starring the actor Sabu. Disney would adapt it again in animated form in 1967, as well as in 1994 and now again in 2016. They also would create some spin-off properties like Talespin and Jungle Cubs (didn’t think I’d remember Jungle Cubs, did you?). If I were to recommend any adaptations though, it would be the very faithful ones that Chuck Jones made of Jungle Book stories “Mowgli’s Brothers”, “Rikki Tikki Tavi” and “The White Seal”. Mowgli in the Cold Lairs with the Bandar-log. However, now that I’ve read these stories for the first time in years, what do I think of them? I think they’re still great. I liked a majority of the stories. I loved pretty much all the Mowgli stories. 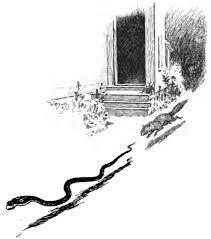 I loved “Rikki Tikki Tavi”. I loved “The White Seal”. I thought “Toomai of the Elephants” was pretty good. I could maybe have done without “Her Majesty’s Servants”, but that’s one story out of seven. The Mowgli stories are essentially just a good coming-of-age story. They’re the tale of Mowgli as he comes into his own and goes from man-cub to man. One would think that this would be a very simple progression. That’s not the case here. In “Mowgli’s Brothers”, we see the first arc of this journey. It starts with him as a baby getting taken in by the wolves and ends with him attaining the power of fire and chasing off Shere Khan. At that point he realizes that he is a man and has to go off to the man-village. In the case of coming-of-age stories, adulthood is often signaled by some sort of sexual awakening (Interestingly, it’s Disney’s version that does that bit). The character falls in love or is awakened in some symbolic way. Instead, Mowgli becomes a man when he gains power over fire. He gains the ability to destroy and alter his environment and that marks him as a man (manhood for the Imperial age, perhaps). It’s still not that simple, though. When he tries to live in the man-village in the story “Tiger! Tiger!”, he finds he does not belong there either. He disdains man’s superstitions and tendency to hunt out of boredom or for sport. It’s when he’s finally killed Shere Khan but is nearly denied his prize by a human hunter and is later turned on by almost the whole village that he turns his back on man. He returns to the jungle and leads his own pack, becoming his own kind of man, a “man of the jungle” if you will. That’s the main arc for Mowgli, but there are more stories about him. One personal favorite and a story that can be kind of controversial comes from The Second Jungle Book. It’s entitled “Letting in the Jungle”. This is the story of what happens when he gets his revenge on the village that cast him out. Basically, after freeing the couple that took him in and was kind to him, he has Hathi the elephant and others “let in the jungle”. Basically, while avoiding killing any humans, he has the jungle claim the village over the course of days. The prey animals eat all the humans’ crops. The predators either eat or set free all their livestock. Finally, the elephants knock down all the buildings and drive all the humans out. It’s such that in a year’s time the entire village has been overgrown by the jungle once again. The story serves as a reminder that nature will reclaim what it can. Mowgli just sped up the process. There’s so much good to talk about. For example, I found that certain stories like “How Fear Came” show that even while these may not be fairy tales, Kipling does understand the power of traditional stories. I was also impressed by how much these stories often hinged on the power of the outsider. Not just Mowgli, but also Kotick the white seal and the mongoose Rikki Tikki Tavi who is a newcomer to the garden he protects. Heck, Mowgli’s presence in the wolf pack is secured by the actions of Baloo and Bagheera, two characters who themselves are not wolves. I do have to acknowledge the Indian elephant in the room. Kipling’s politics were always a bit . . . imperialistic. I mean, this is the guy who wrote “The White Man’s Burden” after all. It’s hard to blame him when you consider that he was practically born into it. His earliest memories are those of enjoying the perks provided to a White British child living in India. It can still be a bit hard to swallow. It does create a rather obvious blind spot in The Jungle Book. Throughout all of the Mowgli stories, he’s almost constantly being critical of human society. But the minute the British show up (usually in the non-Mowgli stories) he lets that all slide. It makes it seem like he believes that both animals with their Jungle Law and the English with their British Law were more civilized than the native Indians. Who knows? Maybe he did. It is something that has affected the reception of his work in the past, even while he was still alive if my research is correct. Overall though, how much it bothers the reader is going to be based on their own sensitivities to such things. I wrote it off as a result of the era and culture and left it at that. Kipling's writing skill is still obvious beyond his now-outdated socio-political ideas. So far, I’ve had a great time revisiting The Jungle Book and I look forward to finishing The Second Jungle Book. I highly recommend revisiting this book and the vast Indian jungles if you should ever get the chance. You may find elements of it that you didn’t notice before. You may discover stories and characters that you never knew you loved. You will also most certainly be guaranteed an adventure.